There’s something very liberating about eating at a sushi bar and leaving everything up to the knife-wielding man behind the counter. I trust that he’ll serve me the best of what he has available, and he trusts me to be open-minded about tastes and prices (eating sushi this way is not cheap). No menu, no ordering, no worrying. 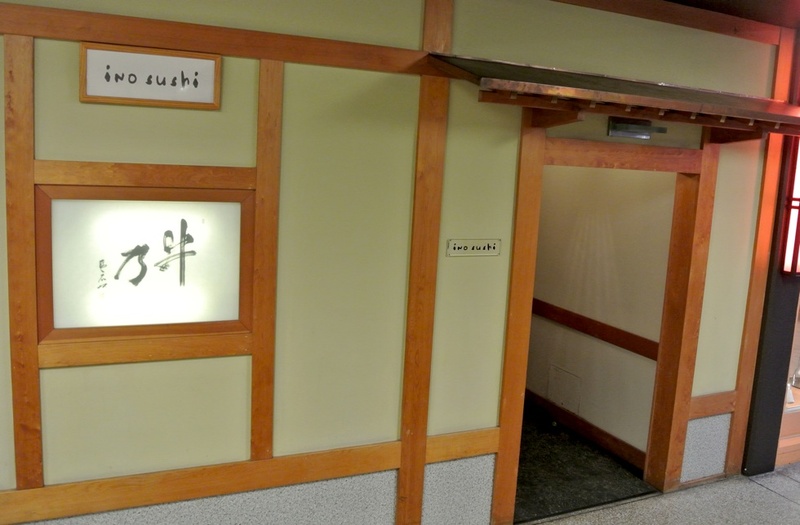 Well, not exactly no worrying, because sometimes you find yourself in front of the real life sushi version of the “Soup Nazi”, liable to yank your chopsticks away and banish you from the establishment without so much as an explanation. 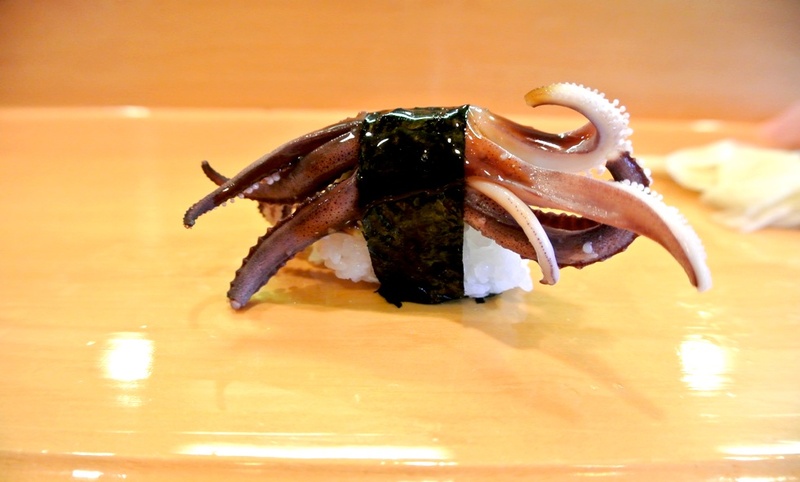 Although I’ve never seen firsthand anything to that extreme, I’ve certainly witnessed my fair share of sushi chefs scolding customers for ordering California rolls and casting menacing glares in the direction of anyone daring to make a special request. For many, it’s ridiculous to endure such treatment, especially when spending good money, but for me, I’ll gladly endure the risk of committing some grand offense knowing that the sushi coming my way is of the highest caliber. Ino-san of Ino Sushi in San Francisco has a reputation that puts him in the category of near-militant chefs known to strike fear into his customers. There’s no smile or pleasantries, just a brief glance that falls somewhere between annoyed and uninterested. He runs his Japan Town restaurant with his wife who does just about everything (including enduring the brunt of Ino’s intensity behind the bar) aside from making the actual sushi. The place is tiny, with no more than ten seats at the counter and a few tables along the back wall leaving little room to escape Ino’s glare. As I walked up to the bar there was no smile or greeting, just a quick glance to size me up that landed somewhere between annoyed and uninterested. I was able to cautiously slide into my seat where I waited for an indication that I was allowed to order. After finishing an order that went out to one of the tables, he suddenly turned to me and without saying a word asked what I want with the intent stare of someone who appears to hate their job but knows deep down that they’re great at it. I quickly asked for omakase and informed him that I would eat whatever he put in front of me. I left it at that, figuring the less I talked the better. He nodded, possibly the only semi-positive gesture throughout the meal, and immediately returned his focus to the large portion of tuna in front of him. My meal had begun. 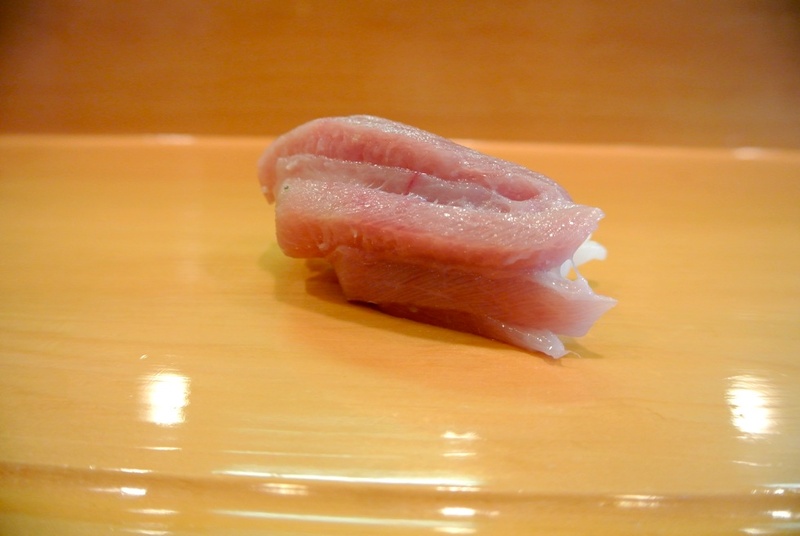 First up was regular tuna, a fish that I tend to overlook when going straight for the fattier cuts. However, the piece here was a good reminder of the more subtle flavors and leaner texture of maguro, while also setting up a point of reference for the next item. 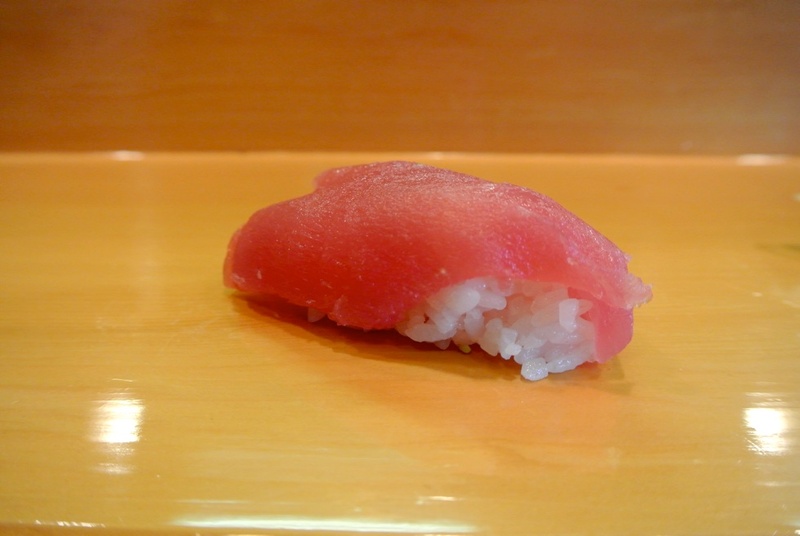 Toro was melting before it even reached my mouth, struggling to keep its shape atop the warm mound of rice. 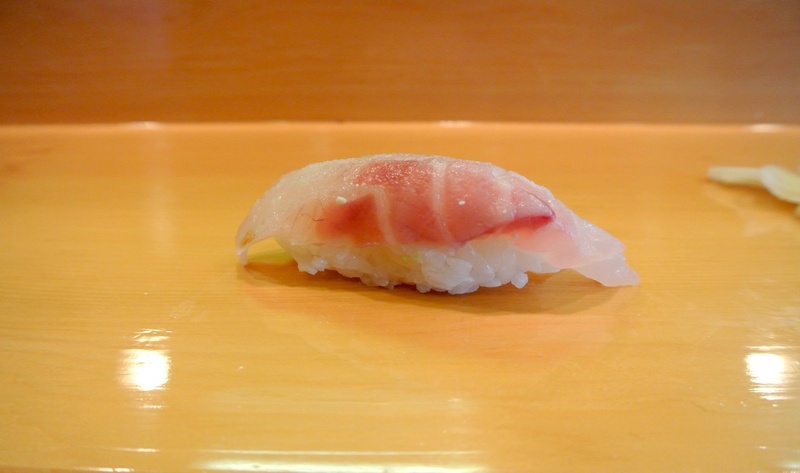 The soft, fattiness of the fish was distinctively different than the maguro before it, showcasing a more marbled appearance and no-chew-necessary composition. I wanted to order another piece as soon as I finished it but knew better than to interrupt Ino-san’s flow. 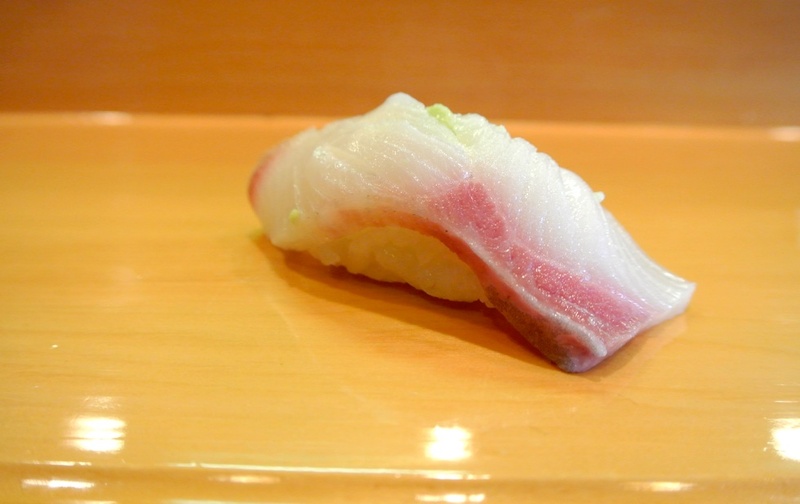 Unfortunately, the lovely looking opaque slice of red snapper was overwhelmed by a heavy dose of wasabi. This would prove to be an issue with a couple of other pieces over the course of meal, which is made difficult because Ino-san isn’t the type of sushi chef you want to ask to do something differently. Like the snapper that preceded it, the taste of the yellow tail here was marred due to the chefs heavy-hand with the application of wasabi. A bummer because it was a great looking cut of fish and had a wonderfully supple texture. 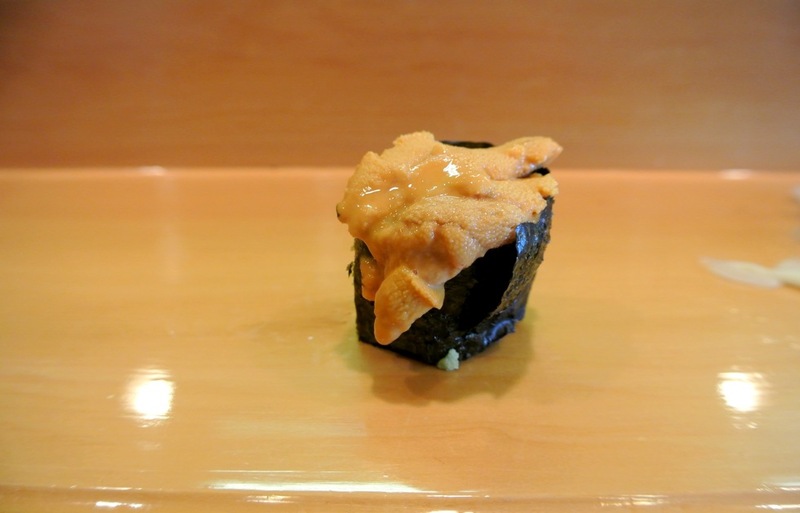 Chef Ino is known for his preparation of ikura, one that left the little orange globules more concentrated in taste with a deeper flavor from what may have been a sake-based marinade. 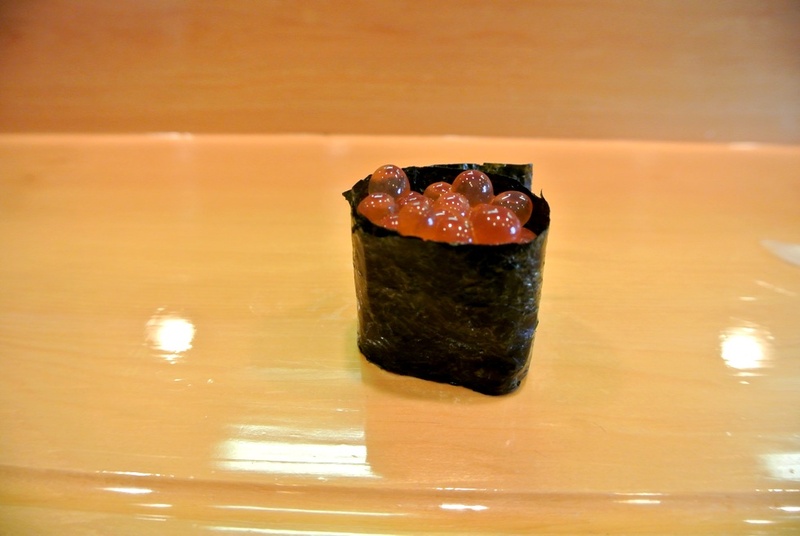 The combination of the initial crunch of the nori followed by the flavorful burst of the salmon eggs is what makes this one of my favorite items, and the version here was among the best that I’ve had. 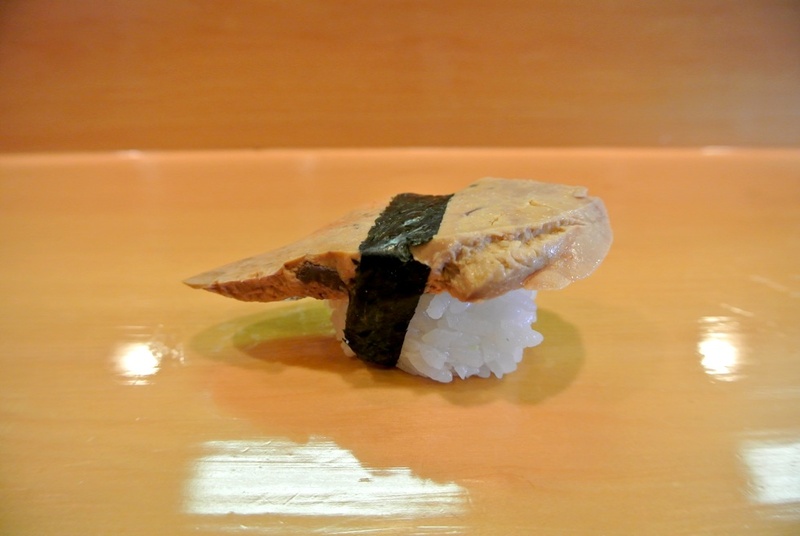 The uni was a bit of a letdown despite its creaminess, as the sweet ocean taste was noticeably lacking. I believe the urchin was sourced from Ft. Bragg, just a few hours north of San Francisco on the coast, and it jut didn’t quite compare to its Santa Barbara relatives. 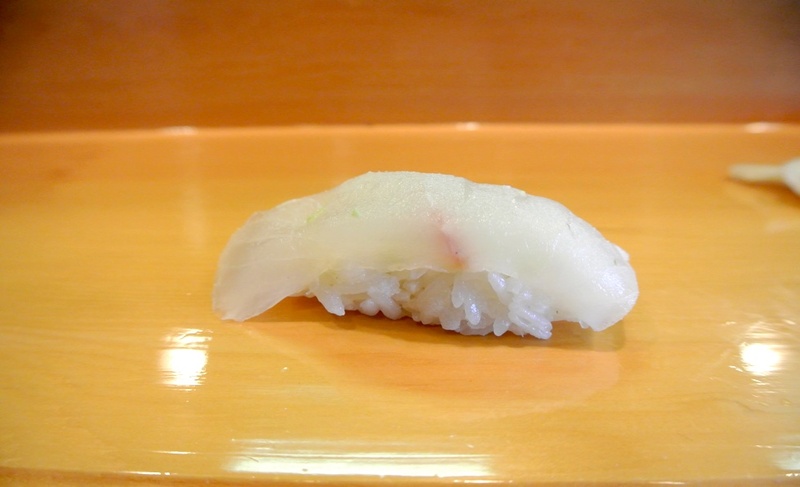 The preparation of ankimo here ranked among the best that I’ve had, arriving slightly warm and on the firm side. I opted not to use any soy sauce, instead letting the natural essence of the liver reach my tongue with very pleasing results. Squid legs were a first, their slight chew an enjoyable compliment to the fluffy rice underneath them. A soy-ish glaze was applied over the top which imparted a touch of sweetness to the faint ocean notes of the legs. 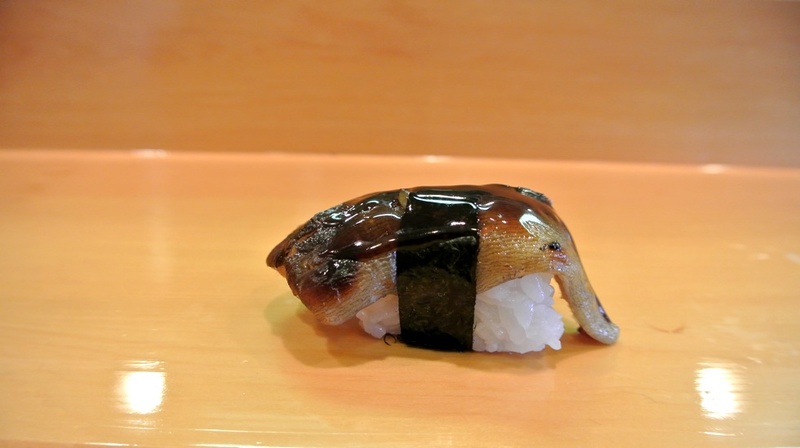 I’d love to see this offered more than the basic and slightly boring eika found at most sushi bars. Like the snapper and yellow tail before it, the amount of wasabi smeared on the underside of the fish made it almost inedible. I seriously considered asking Ino-san to dial it back a bit after this, but the thought of being berated for daring to question anything he had served got me to keep my mouth shut and continue on eating. Although it may have been the smallest piece of aji I had ever been served, it sure packed quite a bit of flavor. It was refreshing to taste the mackerel in its pure form here, void of any ponzu, ginger, green onion, or other garnishes. 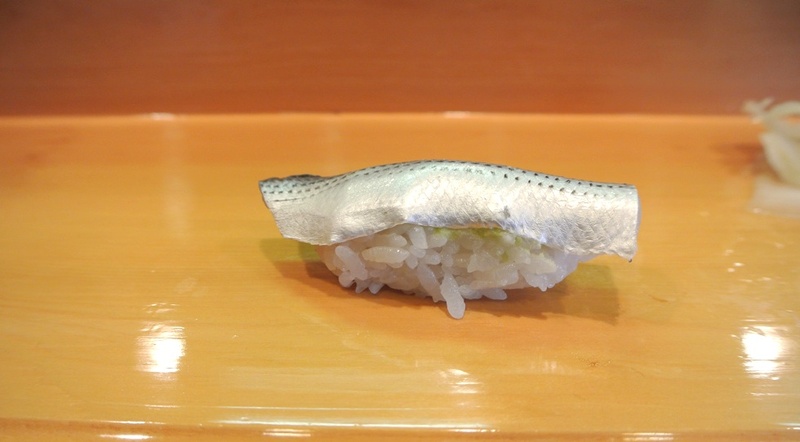 This was my first time having sea bass in sushi form, and I really enjoyed its firm texture. 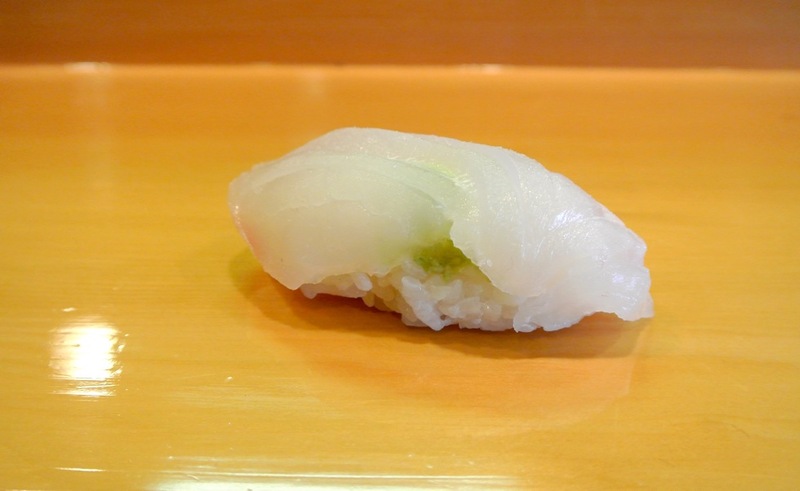 In this case, Ino’s use of wasabi was spot on as there was just enough kick to bring out the subtle flavors of the fish. 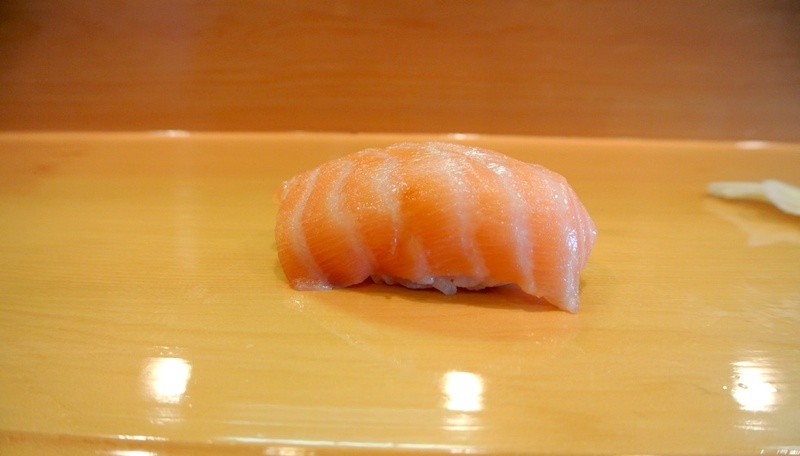 Salmon is eaten so regularly outside of sushi that it sometimes doesn’t get it’s proper due when served raw. The sake here had a lovely orange-and-opaque color and displayed a soft, melt-in-your-mouth bite. I don’t recall where exactly it had been caught, but regardless it was an excellent example of the fish. 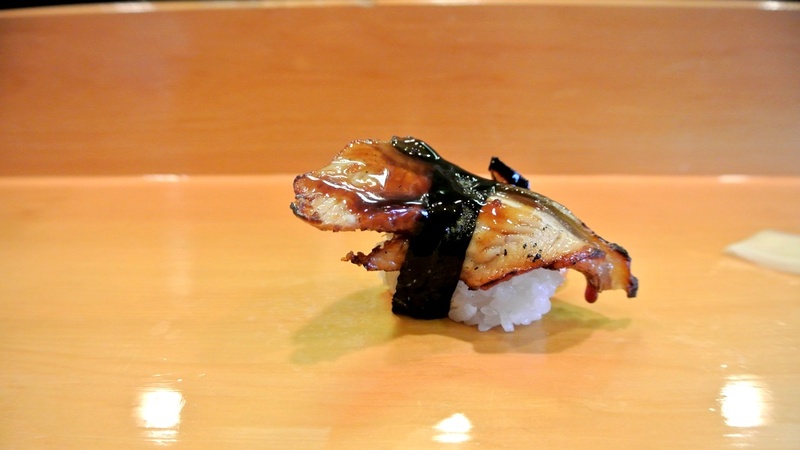 The unagi itself wasn’t as meaty as I would’ve preferred, but was still altogether enjoyable with its smokey char. I also thought that the eel sauce was up there with the best: not too thick and not overly sweet. Similar to its freshwater relative, the sea eel differed a bit from what I’m accustomed to. The skin here played a major role in the flavor, contributing an oiliness that was balanced by the brush of sauce. 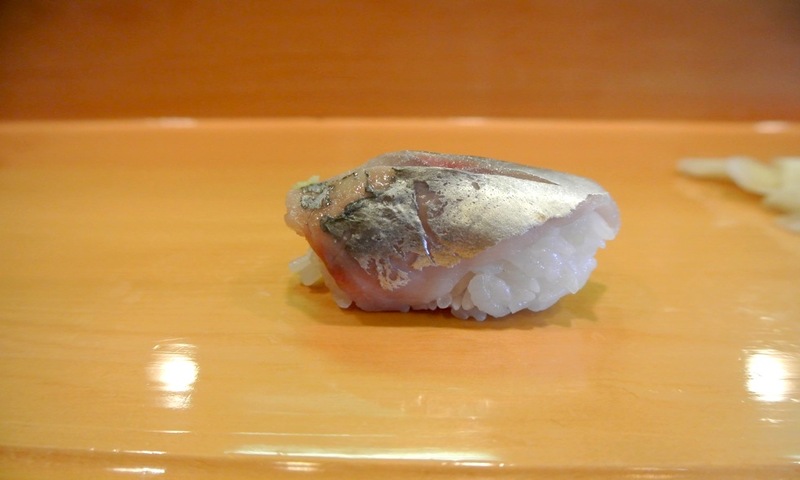 Kohada was spot on here with its characteristic shiny skin and firm flesh. The wasabi teetered on the edge of being overpowering, but it worked just well enough with the underlying vinegary notes of the fish. 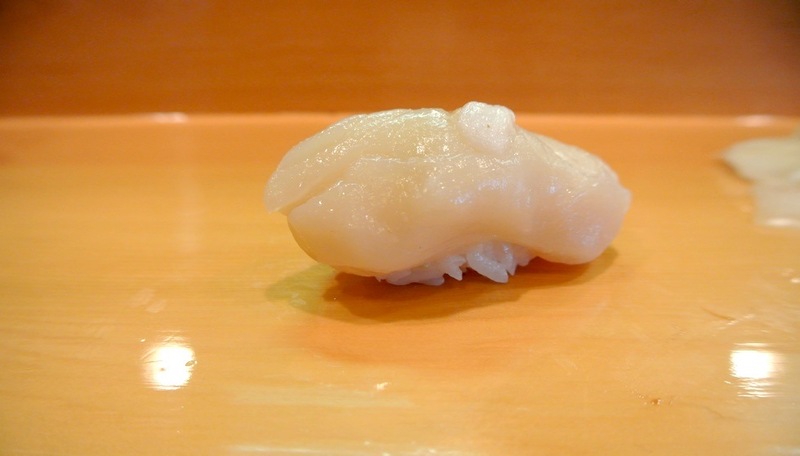 Hotate was plump and creamy, not as sweet as others I’ve had but really a solid example of the mollusk. I appreciated the warm temperature of the rice as it balanced out the coldness of the scallop. 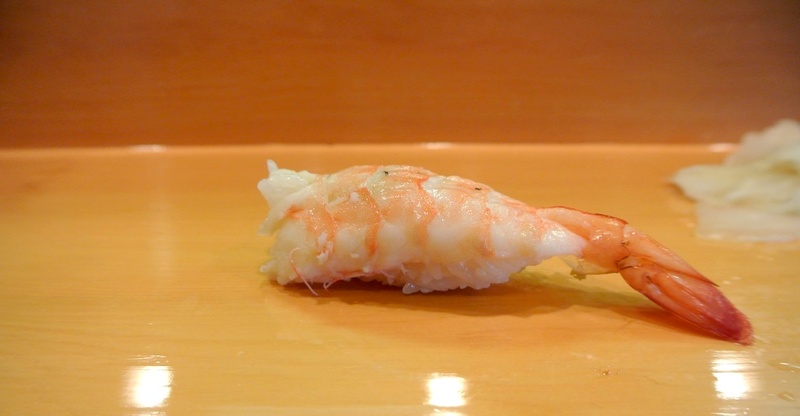 I rarely find myself ordering ebi at sushi, but because Ino was out of sweet shrimp I decided to give it a try here. It had a wonderful, snappy consistency and clean taste that was a fitting way to close out the meal. Despite my initial trepidation at dining under the close scrutiny of Ino-san, I have to say that it was unwarranted for the most part. Sure, he wasn’t eager to chat about ingredients and preparations, or even flash a smile, but at no point during the actual meal did I feel any uneasiness or worry about incurring his wrath. The bottom line is that the sushi was up there with some of the best that I’ve had, relying purely on fresh fish and well honed techniques rather than gold flakes and other flashy additions. The pace of the meal was a bit fast for my liking, but when it’s only one person behind the bar I understand that he has to pace things a certain way. There are a few other sushi spots in SF that I would like to try, but I could certainly see Ino Sushi becoming a regular stop in the future.